Continuous transformation in the digital economy. Digital disruption has emerged as the defining business issue of our age. Yet, despite its ubiquity, organizations across the world struggle to manage digital change and create the conditions required to assure long-term success in the future— the ability to transform continuously. To enable business leaders to respond to this demand to transform again and again, we examined the traits of a digitally sustainable business. 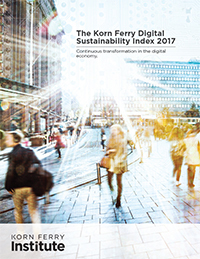 The Korn Ferry Digital Sustainability Index measures 362 organizations across five industries and 14 countries on five dimensions of digital sustainability. Understand the five critical dimensions that foster digital sustainability. Discover how industries and countries perform on the Index. Learn practical ways to develop digital leaders and digitally sustainable organizations.